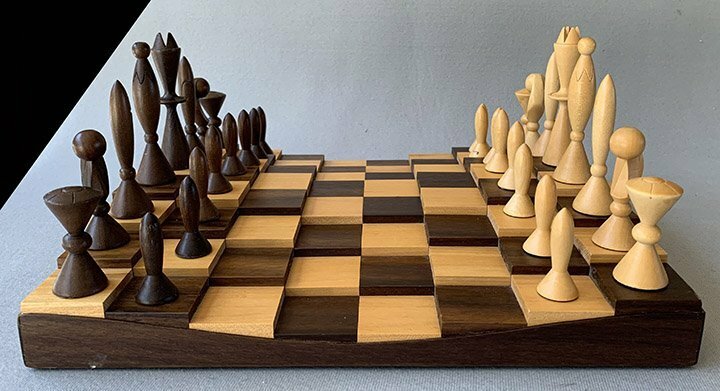 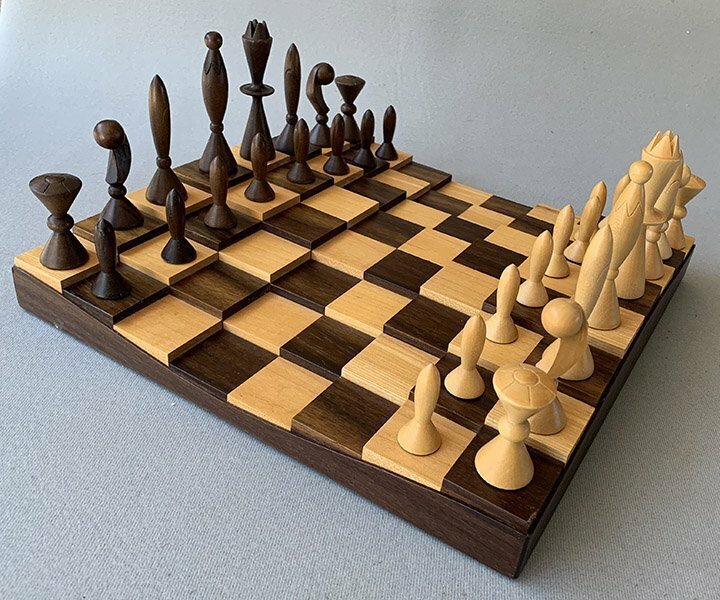 Offered here is a strikingly modern Anri Space Age Chess Set, also known as Universum, housed in a finely crafted wooden case with two fitted compartments to secure the chessmen. 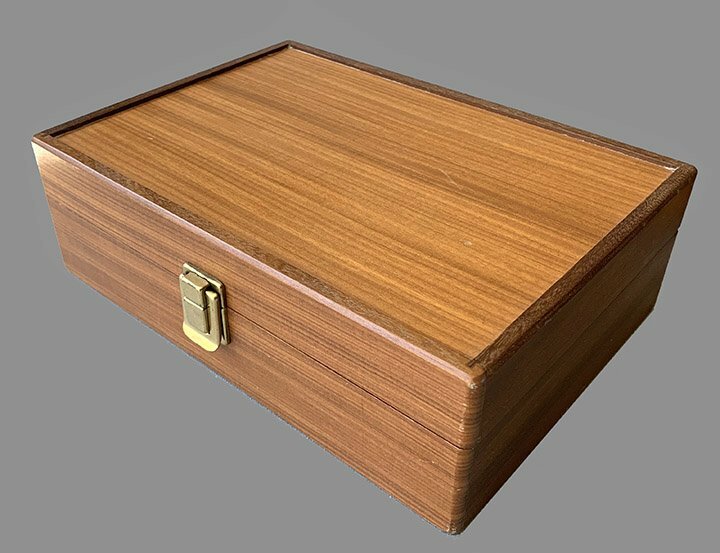 The case measures 11″ long x 3 1/4″ tall x 7 1/2″ wide. 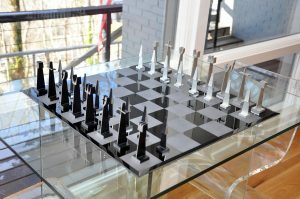 The King stands 4″ tall. The bases are lightly weighted and the pieces rest atop a cushion of brown felt. 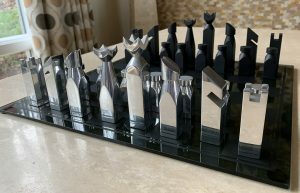 The pieces in the Anri Space Age Chess Set are abstract representations of Space Stations, Space Ships, Missiles, Rockets, Satellites and Radar. 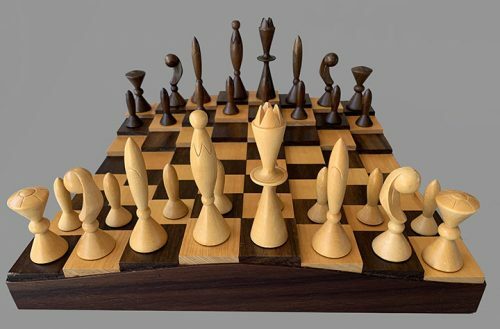 The finely hand carved Anri Space Age Chess pieces are crafted from kiln-dried White Maple and Black Walnut. 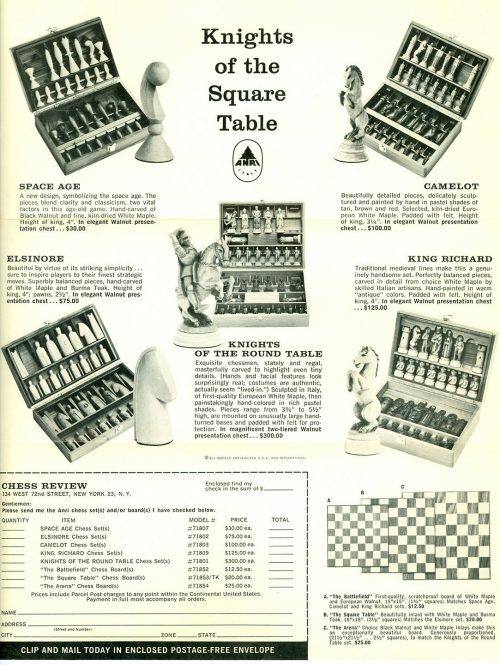 The three ads and the modern chessboard shown are not part of this offering. 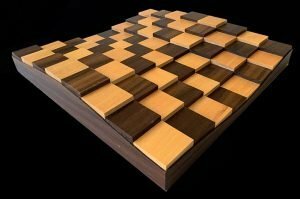 This unique Contemporary Walnut and Maple chessboard shown here, with its contoured playing field, or an authentic Anri Chessboard are available here. The chessmen were designed by U.S. artist Arthur Elliott, who also worked as an early animator for Disney Studios. 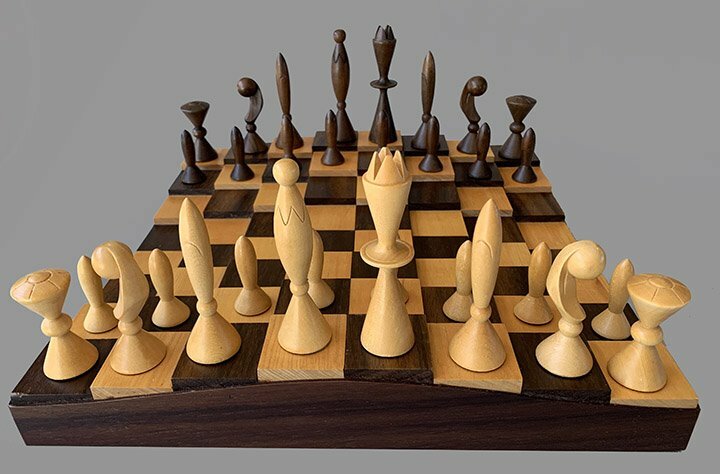 Anri chessmen are 100% made in Italy for those who can appreciate the true value of these magnificent artistic chessmen. The chessmen and case are in excellent condition. 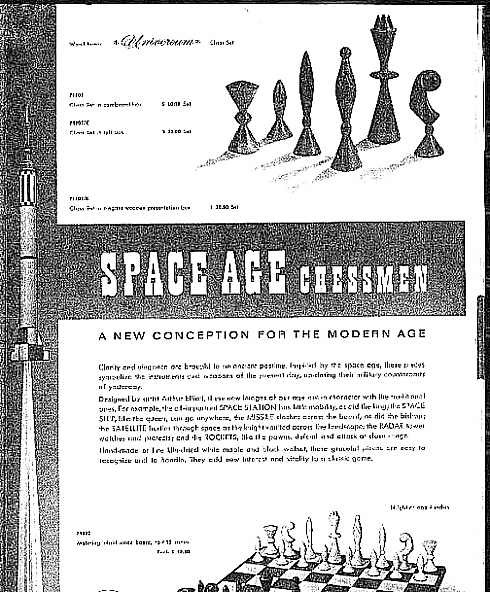 Anri Space Age, or Universum, chess sets were produced between 1958 and 1982. In 1912 Josef Anton Riffeser founded the ANRI Company, which he named using the first two letters of his first and last name. 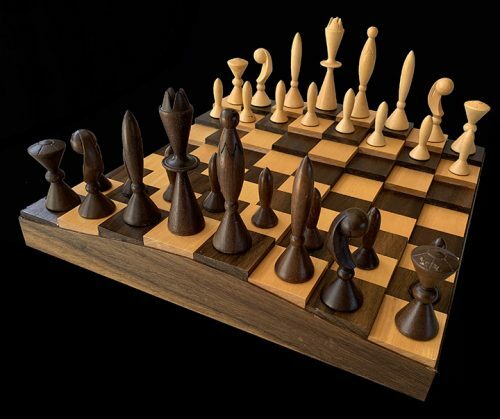 After World War I, where he was in a prisoner of war camp in Siberia, he formulated his plan for a woodcarving company. 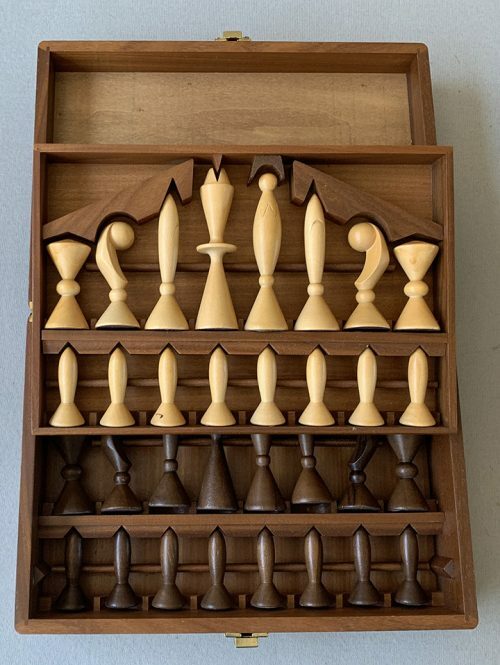 He created his own models which he distributed successfully, mainly in the Alpine region. 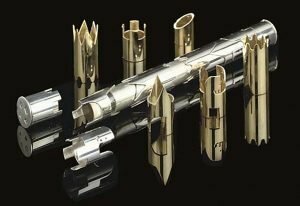 When Anton Adolf Riffeser took over in 1945, he transformed the ANRI company, adopting a more industrial model which allowed for better quality control and distribution to new markets. He was followed by Ernst Riffeser who was able to enlist the services of many well known artists including Juan Ferràndiz, Sarah Kay and others. 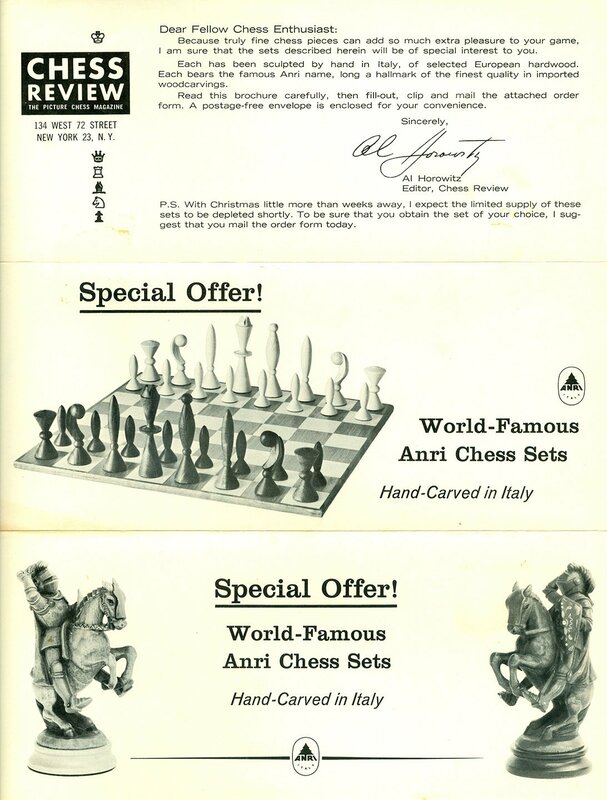 The ANRI company today is run by Thomas Riffeser, and still remains in the same family. The wood art tradition has a long history in Val Gardena, Italy. 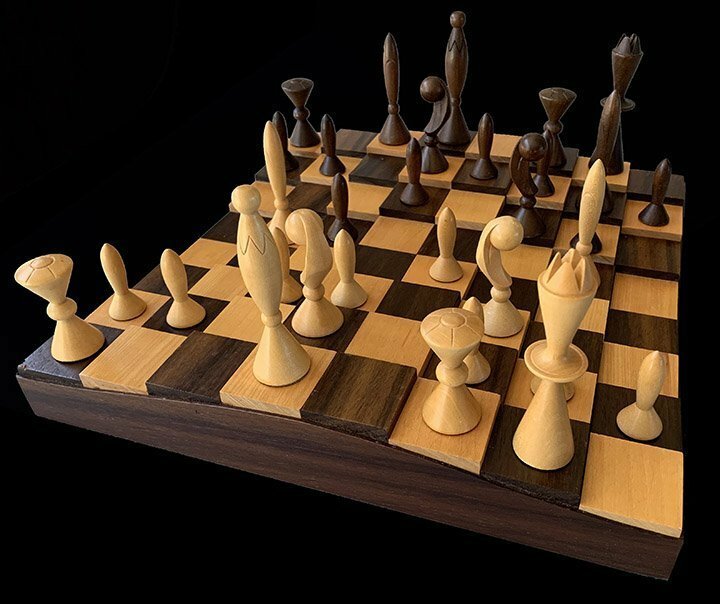 The tradition of woodcarving dates back to the XVII century, when farmers started producing wood toys and utensils during the long winter season. 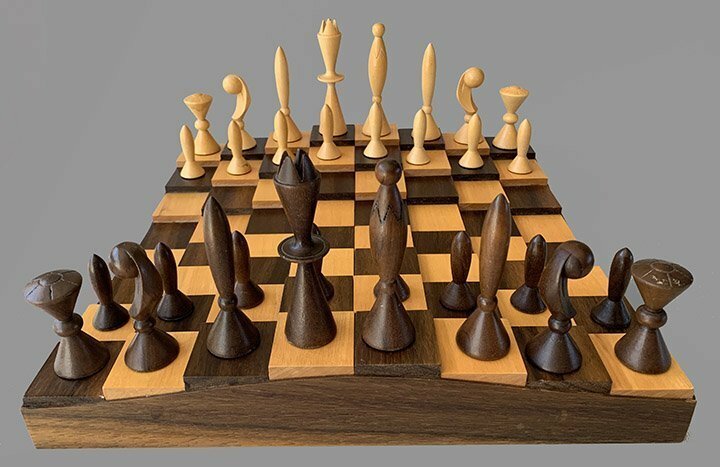 The peasants than used to sell the items at spring markets. 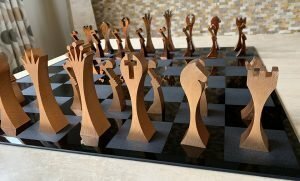 Part of the autonomous region Alto Adige/Southern Tyrol in Italy, the Val Gardena is known for its ancient romantic language, its skiing facilities – and its old tradition of woodcarving. 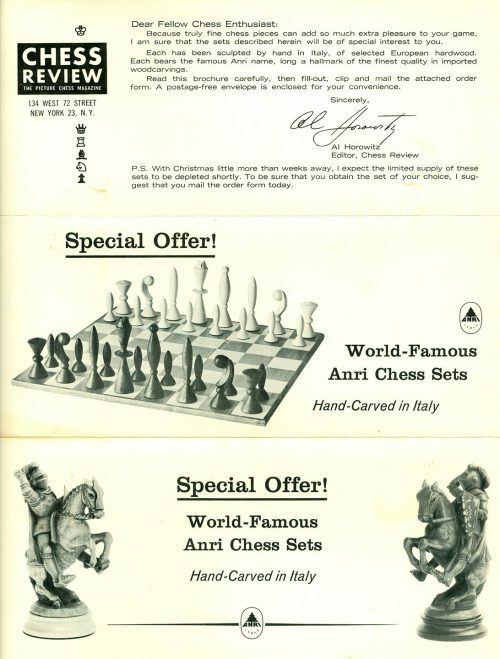 The ANRI company’s chess sets from the 1950s through the 1980s were produced in this region and have gained collectors status, thanks to their unparalleled quality.